I expect some of you will have already seen this bear and his friend on my website or on Facebook. I thought I would take a few moments to explain how he came about and how I surprised myself by entering him in a competition. I set out to make a bear to please myself, I still don't really have a bear of my own at home to keep, apart from some very early ones. 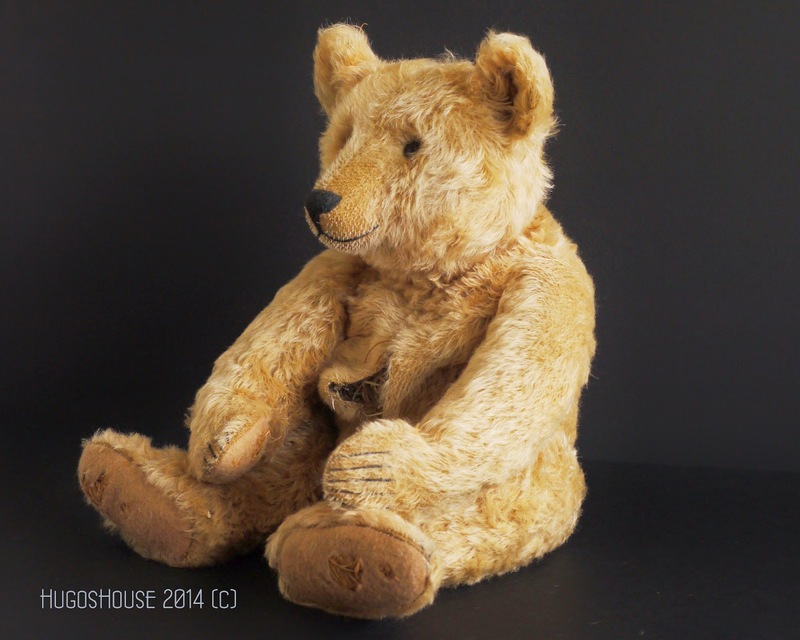 I have a fond memory of a particular bear I saw once at an auction, he was very old, about 1905 or so, and he was almost empty, his feet had worn away and his tummy was open so almost all the wood wool had crumbled away and fallen out, but his fur was still "furry" and his face was intact. So I set out to make a bear just like him, I was going to dare to leave his tummy open and holes in his feet. In the event I made hard work of it of course, I decided that he would only look right if I completed him first, aged him a little in my normal way then eroded the bit which I wanted worn away. In the process this bear was with me for some time, little by little I worked on him on and off eroding bits, staining wood wool until he looked suitably worn out and very saggy, and I think he reached a stage where he was about as fragile as a proper old bear and would need to be looked after carefully to stop any more stuffing tumbling out, he lived in my airing cupboard each time a treatment needed to dry out. This bear was all set to remain unsold at home, after all how can I sell a bear which looks as if it is coming apart. Then I spotted the categories in the competition at the Artist Bear Event in Stratford, one of them was "Attic Treasures" now, I haven't felt the urge to enter anything like that for years and I am usually not responsive to category suggestions etc but this rang a note with me and I decided that as I was going back to the Fair after a few years break I would enter him for fun. 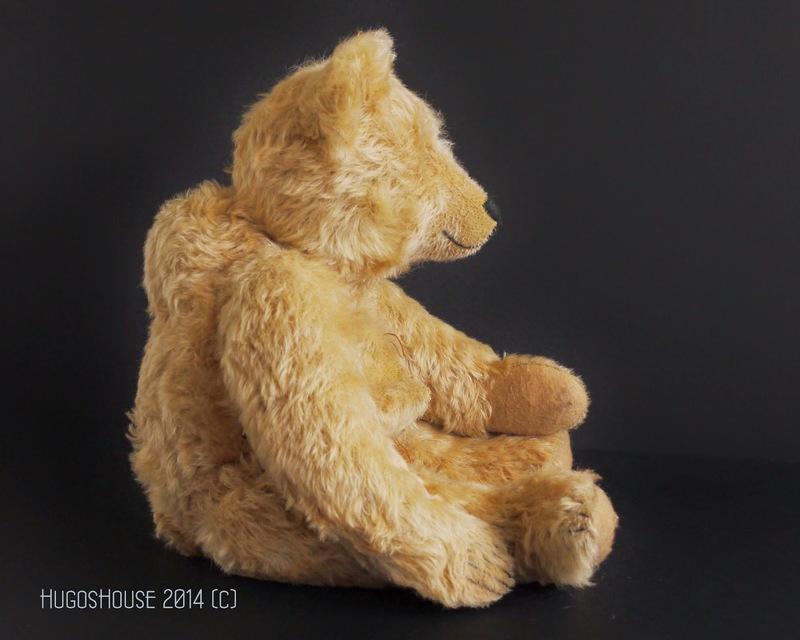 I moved on to thinking about the meaning behind the expression Attic Treasure and thought that my bear was a neglected bear abandoned years ago falling apart in the aforementioned attic and he would need a friend. 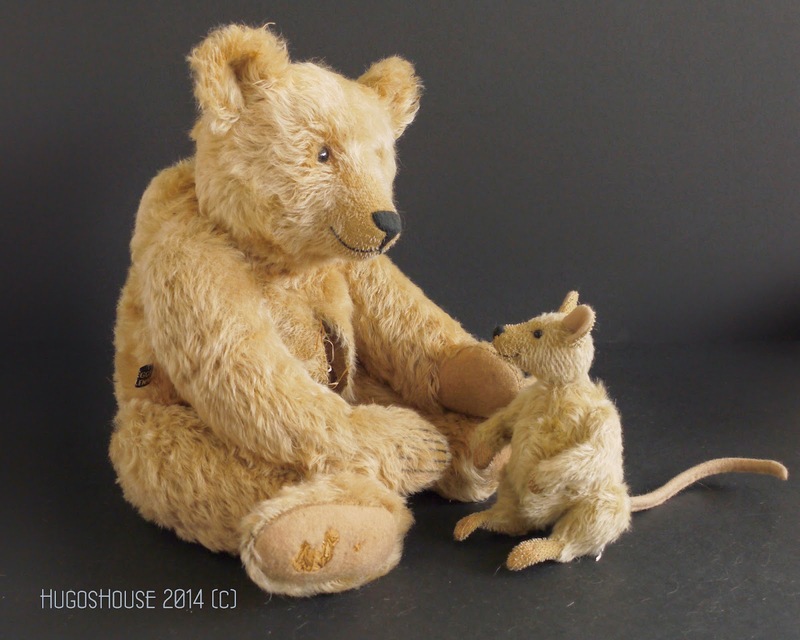 So his friend the mouse was born, a mouse being the most friendly option given the other creatures likely to be found in an attic. Indeed I had recently been following the attempts of a bear world friend who was at war with a squirrel in his own attic. 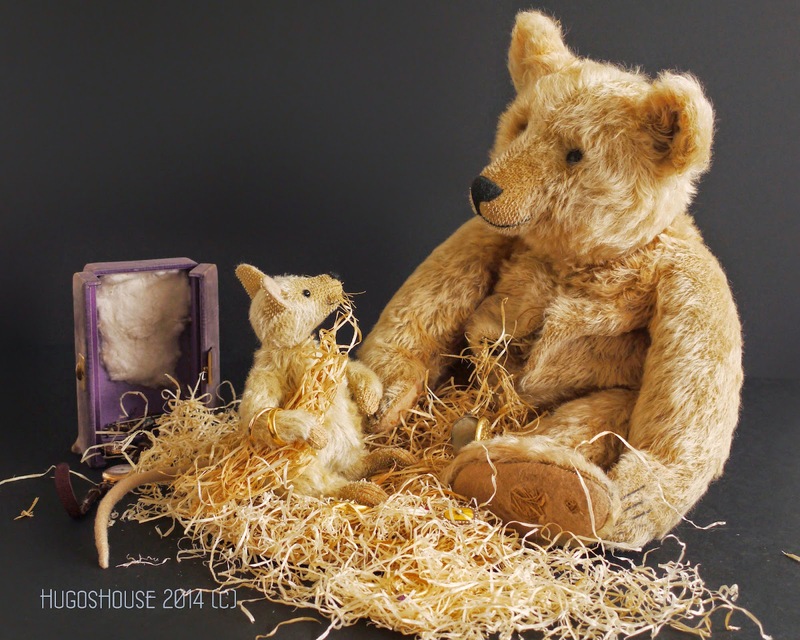 I haven't made a mouse before so that was quite a little project in itself; they make a sweet pair but to link them up I made nest for the mouse from the wood wool tumbling out of the bear. 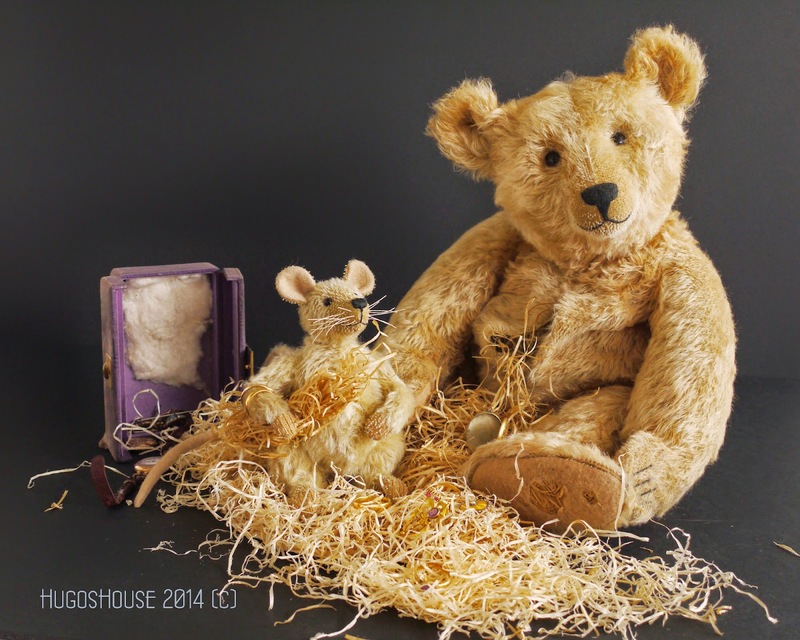 So the mouse found his own treasure and the bear has a friend. As a final touch on the finished piece, purely for my own sentimental reasons I added some little treasures from home, the mouse was wearing my Mum's and my Grandmother's wedding rings and their engagement and eternity rings were scattered in the mouse's nest to be taken care of. All set on the day I arrived to find that there were already quite a few entries laid out and my little tableau had to go at the back surrounded by some other very impressive creations it looked quite modest but it was under a convenient spotlight. Thanks to all the very kind people who voted on the day. 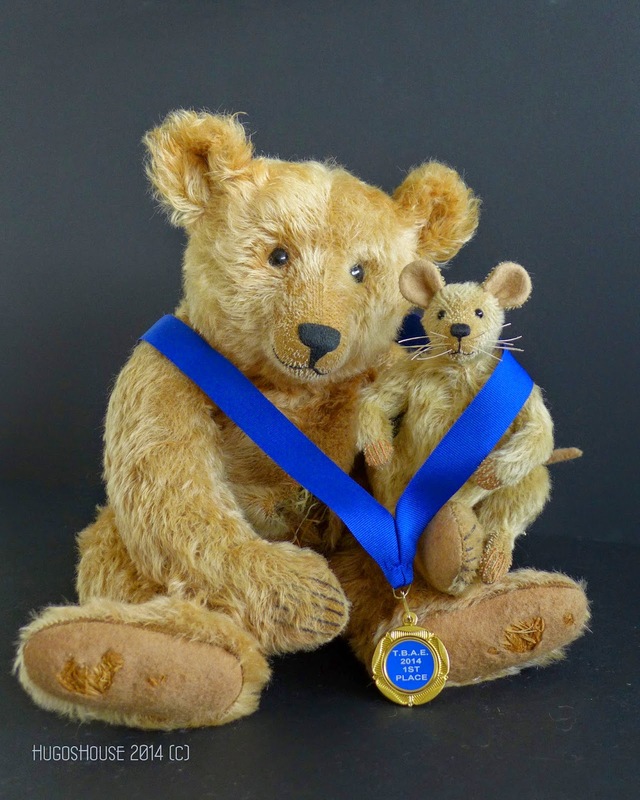 colleagues and public alike my old bear and his friend were awarded first place. Now I am faced with a dliemma because since then I have been asked many times if I will sell him, and the mouse, I am reluctant because of the nature of the layout and the fragility of the bear but I am going to have a sealed auction, more details with be posted very shortly but it will be done through my website www.hugoshouse.com where I am preparing a special page with more information about the piece, and how to enter the bidding, to find them an appreciative home. 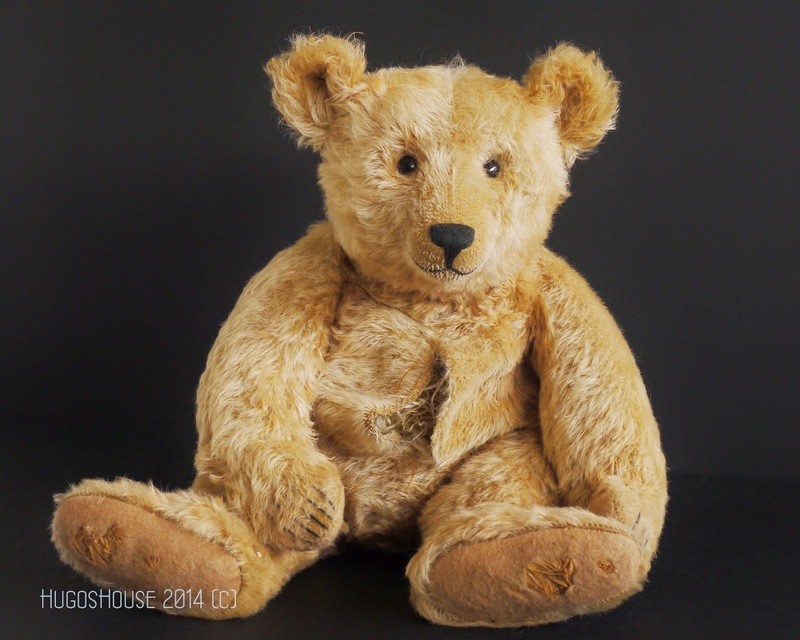 I have been designing and making Teddy bears since 1992. My original inspiration was the classic German Teddy with long elegantly tapered arms, a humped back and pronounced snout. Through the years I evolved different styles and enjoy the challenge of making a bear with a strong scuptural shape and substance, sometimes with bold colours and contrasts. 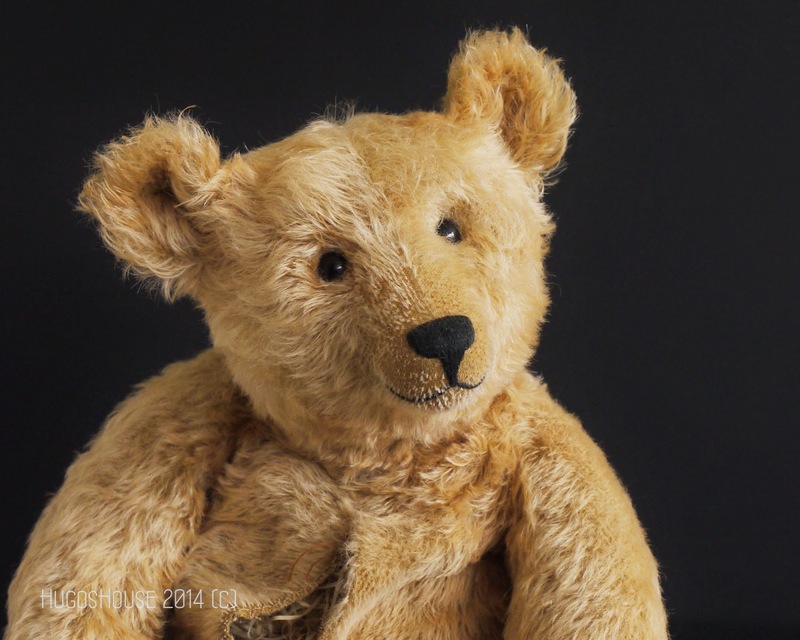 Whatever the style of bear I make it is important to me to recall the origin of the Teddy Bear as a gentle creature of cloth and felt and needlework, so even a large grisly bear will always be a Teddy Bear at heart. I still very much enjoy the challenge of capturing the spirit and style of those early bears too and constantly revise patterns and details as an ongoing creative process.